Andy Peaks knows AFC Rushden & Diamonds are now dealing in wins if they are to keep their Evo-Stik League South Premier Division Central play-off hopes alive. Diamonds head to St Ives Town tomorrow (Saturday) on the back of a penalty shoot-out defeat at the hands of Brackley Town after a goalless draw in the NFA Hillier Senior Cup final on Tuesday night. While Diamonds were in cup action, Alvechurch were claiming a 2-1 victory over Leiston to firm up fifth place in the league table. Peaks’ team are now six points adrift of the play-off places and will probably now have to win all five of their remaining matches if they are to force their way into the top five. It’s a tall order but the Diamonds boss insists there is still belief within the squad that they can pull it off. “We have got to dust ourselves down,” Peaks said. “It’s disappointing to have lost on penalties but the one thing I know about these boys is that they will come back with a lot of character. 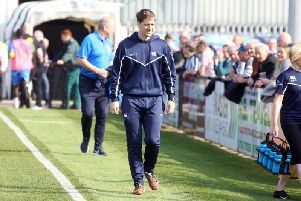 “It’s a really tough game at St Ives and we need three points to get back on the play-off trail. “It wasn’t a great result for us with Alvechurch winning. But to be honest, I am not looking too much at other results. “We have got five games and we have got to get some points out of those and see where it takes us. “Obviously we need other teams to do us a favour but we have got to start winning games to maintain a promotion push. “I don’t think there is much pressure on us because I am sure most people will say that we aren’t going to do it. “But if we go and win our next five games then we probably will do it. Diamonds, meanwhile, will be assessing the fitness of frontman Ben Diamond after he was withdrawn late on in Tuesday’s final. “Ben rolled his ankle near the end, which was disappointing because I thought he was excellent as were most of them,” Peaks added. “But we will see how he is in training and then pick the team accordingly."